Iarnród Éireann (Irish pronunciation: [ˈiəɾˠnˠɾˠoːdˠ ˈeːɾʲən̪ˠ]), also known as Irish Rail in English, is the operator of the national railway network of Ireland. Established on 2 February 1987, it is a subsidiary of Córas Iompair Éireann (CIÉ). It operates all internal InterCity, Commuter, DART and freight railway services in the Republic of Ireland, and, jointly with Northern Ireland Railways, the Enterprise service between Dublin and Belfast. In 2018, IÉ carried 48 million passengers, up from 45.5 million in 2017. A 29000 Class Commuter train at Tara Street Station, Dublin, in 2006. The LED display is showing "Destination: Pearse Station" in Irish. Until 2013 Ireland was the only European Union state that had not implemented EU Directive 91/440 and related legislation, having derogated its obligation to split train operations and infrastructure businesses, and allow open access by private companies to the rail network. A consultation on the restructuring of Iarnród Éireann took place in 2012. The derogation ended on 14 March 2013 when the company was split in 2 sectors: Railway Undertaking and Infrastructure Manager. At the time of its establishment the company referred to itself as Irish Rail, and adopted the four rails IR logo. In 1994, the company brought the Irish form of its name to the fore, introducing a logo and corporate branding based on the letters IÉ (Iarnród_Éireann) corporate branding and logo. However, both languages remained part of the official company name ("Iarnród Éireann – Irish Rail"). In 2013, new bilingual branding was introduced. IÉ's passenger services are branded under three main names; InterCity, Commuter and DART. InterCity services are long-distance routes radiating mainly from Dublin. The Belfast – Dublin service, jointly operated with Northern Ireland Railways, is branded separately as Enterprise. Dublin's two main InterCity stations are Connolly and Heuston. Intercity services run to/from Cork, Limerick, Tralee, Ennis, Galway, Waterford, Rosslare Europort, Sligo, Westport, Wexford and Ballina. Dublin's third major station, Pearse, is the terminus for much of the suburban network in the Greater Dublin area. An additional InterCity service runs from Limerick to Waterford. This service formerly operated through to Rosslare Europort but services between Waterford and Rosslare Europort ceased after the last train on 18 September 2010. Bus Éireann now operates route 370 through the affected towns as replacement transport. A new service began on 31 March 2010 from Limerick to Galway, as part of the Western Rail Corridor, a reopening of a long-closed line. A January 2012 national newspaper article suggested that Iarnród Éireann was expected to seek permission in the near future from the National Transport Authority to close the Limerick–Ballybrophy railway line and the Limerick–Waterford line. The majority of Commuter services are based in Dublin, which has four commuter routes: Northern (Dundalk), Western (Maynooth/Longford), South Western (Newbridge/Kildare/Portlaoise) and South Eastern (Gorey). See Dublin Suburban Rail for more details. The Cork Suburban Rail currently has three Commuter services: to Mallow and Cobh, and a third service to Midleton which became operational on a part of the disused Youghal branch line on 30 July 2009. Limerick Suburban Rail currently consists of two lines to Ennis and Nenagh, with shuttle services to Limerick Junction. A Commuter service operates between Galway to Oranmore and Athenry. Commuter trains also operate on shuttle duty for branches from the main InterCity services from Mallow to Tralee (off the Dublin – Cork route) and from Manulla Junction to Ballina (off the Dublin – Westport route), as well as acting as InterCity trains for Dublin – Rosslare and some Dublin – Sligo services, and as the aforementioned Limerick – Limerick Junction – Waterford service. The North-South route along Dublin's eastern coastal side is also host to DART, Ireland's only electrified heavy-rail service. The DART consists of many classes, the oldest and most famous one being the 8100 class which still operate, now extensively refurbished. The following is a simplified table of weekday off-peak services, various irregular calling patterns have been omitted for clarity. 4tpd extend to/from Rosslare Europort, calling at Enniscorthy, Wexford and Rosslare Strand. Additional 1tpd southbound-only to Wexford. Clonsilla to M3 Parkway 1tph Hansfield and Dunboyne At peak times extends to/from Docklands, calling all stations. DART Howth to Bray Daly 3tph Sutton, Bayside, Howth Junction & Donaghmede, Kilbarrack, Raheny, Harmonstown, Killester, Clontarf Road, Dublin Connolly, Tara Street, Dublin Pearse, Grand Canal Dock, Lansdowne Road, Sandymount, Sydney Parade, Booterstown, Blackrock, Seapoint, Salthill & Monkstown, Dun Laoghaire Mallin, Sandycove & Glasthule, Dalkey, Killiney and Shankill. 1tph extended to Greystones. Malahide to Bray Daly 3tph Portmarnock, Clongriffin, Howth Junction & Donaghmede, Kilbarrack, Raheny, Harmonstown, Killester, Clontarf Road, Dublin Connolly, Tara Street, Dublin Pearse, Grand Canal Dock, Lansdowne Road, Sandymount, Sydney Parade, Booterstown, Blackrock, Seapoint, Salthill & Monkstown, Dun Laoghaire Mallin, Sandycove & Glasthule, Dalkey, Killiney and Shankill. 1tph extended to Greystones. Bulk Freight – specialises in operating full train loads of freight, usually bulk movements of single products such as cement, mineral ore or timber. Intermodal – container trains, currently operated between Waterford Port and Ballina and Dublin Port and Ballina. Navigator – the freight forwarding division, particularly associated with the transport of automotive stock parts. The Enterprise route (Dublin to Belfast) is well regarded. However it is only double track and serves both local and intermediate Commuter as well as InterCity traffic. Hence any delay has knock on effects. Also there is limited platform availability at Connolly Station in Dublin. There was also a persistent problem with engine overloading, as Enterprise locomotives also supplied coach power. However, since September 2012, additional power is provided by separate Mark 3 generator vans. The Cork-Dublin route was formerly the "premier line" of the Great Southern and Western Railway, one of the biggest pre-CIÉ operators. Rolling stock on this route consists of Mark 4 trains, which were built in Spain, complete with DVTs for faster turn-around. 22000 Class DMUs built in South Korea came into service from early 2007 replacing older coaching stock on most other InterCity routes. These 183 carriages are described by the company as the "Greenest diesel trains in Europe". The former Minister for Transport, Noel Dempsey TD had announced that an additional 51 railcars had been ordered for the company for a planned introduction on services between Dublin, Louth and Meath. They were placed into service in 2011/2012 but this plan was badly affected by the recession with 21 surplus to requirements at the end of 2012. The maximum speed of InterCity trains on the IÉ rail network is 160 km/h (100 mph). Since 2019, Irish Rail have been trying to get more female drivers. IÉ's Network Catering unit provided a trolley service of food and drink, a snack car and (on some routes) a restaurant service. It also operated a restaurant at Dún Laoghaire. According to Iarnród Éireann's annual report, the unit lost €270,000 in 2004. 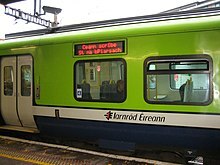 Early in 2006, Iarnród Éireann advertised for private catering contractors to take over the operation of its catering services. The service was taken over by Rail Gourmet in March 2007. Rail Gourmet later withdrew from the contract and no longer provide catering for any Irish Rail services. InterCity services have a fleet of 265 carriages. Commuter services have a fleet of 148 carriages. DART services have a fleet of 134 carriages. Dublin-Belfast Enterprise has a fleet of 28 carriages. IÉ's increasing fleet usage has led to requirements being made for the procurement of additional vehicles. DART services are running with all trains formed of at least six cars, while the entire operational fleet of ICRs is committed to services. To this end, IÉ plans to purchase a significant number of new ICR vehicles - an initial purchase of 41 will be made for delivery in 2021, comprising three new trains, with the remainder planned as intermediate vehicles to lengthen existing units. The deal for the new vehicles is intended to include options for up to 40 further vehicles. There are also plans for a total replacement of the existing DART fleet, which will be combined with extensions to the DART network. The framework for the DART fleet is planned for up to 600 vehicles formed into four-car and eight-car sets, split into both pure EMU and BEMU trains. For immediate fleet capacity increases, IÉ planned a refurbishment of its 2700 Class DMUs, which was subsequently cancelled. Instead, IÉ is discussing the possibility of sourcing surplus DMUs from the British network, with Class 170s and Class 185s available. ^ a b c Iarnród Éireann. "Iarnród Éireann Annual Report 2017" (PDF). Retrieved 4 October 2018. ^ a b c d Pritchard, Robert (February 2019). "Current and Future Fleet Development on Irish Rail". Today's Railways. Platform 5. Wikivoyage has a travel guide for Rail travel in Ireland.